For the surname, see Perea (surname). Perea or Peraea (Greek: Περαία, "the country beyond"), was the portion of the kingdom of Herod the Great occupying the eastern side of the Jordan River valley, from about one third the way down from the Sea of Galilee to about one third the way down the eastern shore of the Dead Sea; it did not extend very far to the east. Herod the Great's kingdom was bequeathed to four heirs, of which Herod Antipas received both Perea and Galilee. He dedicated the city Livias in the north of the Dead Sea. In 39 CE, Perea and Galilee were transferred from disfavoured Antipas to Agrippa I by Caligula. With his death in 44 CE, Agrippa's merged territory was made province again, including Judaea and for the first time, Perea. 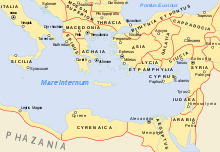 From that time Perea was part of the shifting Roman provinces to its west: Judaea, and later Syria Palaestina, Palaestina and Palaestina Prima. Attested mostly in Josephus' books, the term was in rarer use in the late Roman period. It appears in Eusebius' Greek language geographical work, Onomasticon, but in the Latin translation by Jerome, Transjordan is used. Gadara of Perea (identified as Tell Jadur near Al-Salt ) was the chief city or metropolis of Perea (not to be confused with Gadara of the Decapolis−a Hellenistic city). Following the Roman conquest of Judea led by Pompey in 63 BCE, Aulus Gabinius, proconsul of Syria, split the former Hasmonean Kingdom into five districts of legal and religious councils known as Sanhedrin and based at Jerusalem, Jericho, Sepphoris (Galilee), Amathus (Perea) and Gadara (Perea—Al-Salt or Decapolis—Umm Qais). Peraea ...much larger indeed [than Galilee], is generally desert and rugged, and too wild for the growth of delicate fruits. In some parts, however the soil is loamy and prolific, and trees of various kinds cover the plains ; but the olive-tree, the vine, and the palm tree, are those principally cultivated. It is also sufficiently irrigated by mountain streams ; and (should these in the dog-days fail) by ever flowing springs. In length, it extends from Machaerus to Pella : in breadth, from Philadelphia to the Jordan : its northern districts being bounded, as we have already said, by Pella ; and those on the west, by the river. The land of Moab forms its southern limit ; while Arabia and Silbonitis, with Philadelphia and Gerasa, constitute its eastern boundary. Ptolemy does not use the term Perea in his Geography, but rather the periphrasis "across the Jordan". And he enumerates the "Perean" cities; Cosmas, Libias, Callirhoe, Gazorus, Epicaeros in this district. Perea was the area inhabited by the Israelite Tribes Reuben, Gad, and the half tribe of Manasseh. New Testament commentators speak of Jesus' "Perean Ministry", beginning with his departure from Galilee (Matt 19:1; Mark 10:1) and ending with the anointing by Mary in Bethany (Matt 26:6) or his journey towards Jerusalem commencing from Mark 10:32. The Christian Armenians who were deported from Armenia and forcibly settled in the New Julfa/Isfahan region of Iran named a major village "Perea" in honor of the important significance of Perea as the resting place of John the Baptist. Perea in c.350 CE according to Eusebius and Jerome (map as reconstructed by George Adam Smith, 1915). ^ Josephus. BJ. 2.6.3. .
^ Josephus. BJ. 2.9.1. .
^ Two cities of Perea, Abela and Iulias (Livias), make an exception, having been kept by Agrippa II (Mason, S. Josephus. BJ. 2.13.2. .) to his death c. 100 CE. ^ "When Did Alexander Yannai Capture Which Gadara?". Retrieved 4 July 2016. What may be concluded from these observations is that it was probably Gadara of the Peraea, not the more famous city [Gadara] of the Decapolis, that Yannai conquered early in his reign, as indicated in War 1.86 // Ant 13.356. This allows us to maintain an early dating of 102/101 BCE for the conquest of Gadara of the Peraea, alongside Amathus, while it also allows us to accept the inscription of 84 BCE as providing a terminus post quem for the conquest of the Gadara of the Decapolis. ^ Josephus. AJ. 14.5.4. , Perseus Project AJ14.5.4, . : "And when he had ordained five councils (συνέδρια), he distributed the nation into the same number of parts. So these councils governed the people; the first was at Jerusalem, the second at Gadara, the third at Amathus, the fourth at Jericho, and the fifth at Sepphoris in Galilee." ^ Malamat, Abraham; Ben-Sasson, Haim Hillel (1976). A History of the Jewish People. Harvard University Press. p. 262. ISBN 978-0-674-39731-6. Jewish Trans-Jordan reached from the hellenized city Pella (Fahal) in the north to Machaerus. east of the Dead Sea. in the south. Its western border was the Jordan River, and in the east it extended until the territory of the Greek cities Gerasa and Philadelphia. The settled area of the Peraea was divided into two parts. The smaller and doubtlessly less populated area lay north of the Jabbok. Its most important settlement was Amathus, a strong fortress from the hellenistic period that had been conquered by Alexander Jannai and had become a Jewish town of some importance, the seat of a local Sanhedrin in the days of Gabinius and the capital of a toparchy. However. the majority of the Jews in Trans-Jordan lived south of the Jabbok, across the river from north-eastem Judea. The capital of this region was Gador (Es-Salt). which was considered the capital of the entire Peraea. South of Gador lay Abila (Abel-shittim) and Beth-haramata, and still farther to the south was the fortress Machaerus. Thus, geographically, the situation of Jewish Trans-Jordan was marked by two characteristics: its nearness to and common border with Judea and its location within the generally hostile neighborhood of the Greek cities to the east and north. ^ Ḳornfeld, Geʾalyahu; Mazar, Benjamin; Maier, Paul L. (1 January 1982). Josephus, the Jewish War: Newly Translated with Extensive Commentary and Archaeological Background Illustrations. Zondervan Publishing House. p. 42. ISBN 978-0-310-39210-1. ...Jewish TransJordan was represented by two councils: one in Gadara (Gedor), identified as E-tell in Peraea, near modern es-Salt in Jordan, and the other in Amathus (Hamthan), southeast of the Sea of Galilee. ^ "PLINY'S NATURAL HISTORY - Book V". masseiana.org. masseiana.org. Archived from the original on 1 January 2017. Retrieved 1 August 2015. ^ Jones, A. H. M. (30 June 2004). "Appendix 2. Ptolemy". The Cities of the Eastern Roman Provinces, 2nd Edition. Wipf & Stock Publishers. p. 500. ISBN 978-1-59244-748-0. Ptolemy’s divisions of Palestine (v. xv) appear to follow popular lines. They are Galilee, Samaria, Judaea (with a subdivision 'across the Jordan'), and Idumaea. These divisions were also for the most part, as Josephus’ survey of Palestine (Bell., III. iii. 1-5, §§ 35-57) shows, official. Josephus, however, does not recognize Idumaea, merging it in Iudaea, and definitely distinguishes Peraea from Judaea. Had Ptolemy derived his divisions from an official source, he would probably have followed this scheme, and in particular would have used the official term Peraea instead of the periphrasis 'across the Jordan'. ^ Taylor, Joan E. (30 January 2015). The Essenes, the Scrolls, and the Dead Sea. Oxford University Press. p. 238. ISBN 978-0-19-870974-9. Ptolemy’s Geographica provided a great compendium of knowledge in terms of the placements of cities and lands in the ancient world, information that would form the basis of medieval cartography, resulting in a standard Ptolemaic map of Asia, including Palestine. The information about Judaea appears in Book 5, where pars Asphatitem lacum are mentioned as well as the main cities. In the region east of the Jordan, there are sites that are not all easy to determine: Cosmas, Libias, Callirhoe, Gazorus, Epicaeros (Ptolemy, Geogr. 5: 15: 6).